New HD master from a 4K scan of the original Trucolor negative and positive separations! Ray Milland (Panic in Year Zero! 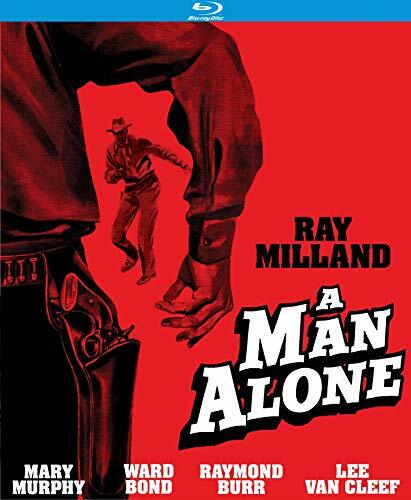 ), Ward Bond (Dakota), Raymond Burr (Pitfall) and Lee Van Cleef (Barquero) are headed for a lethal showdown of greed, treachery and vengeance in this blazing Western adventure directed by Milland (Lisbon). When notorious gunslinger Wes Steele (Milland) chances upon the gruesome remains of a stagecoach robbery, he reports the carnage in a nearby town. But there he is framed for the crime by Stanley (Burr), the town’s most respected citizen, who secretly committed the murders himself as part of an intricate bank robbery scheme. Escaping the town’s relentless lynch mob, Wes finds refuge in the house of the local sheriff (Bond), where he falls for his host’s winsome daughter (Mary Murphy, The Wild One) and gradually wins the lawman’s trust and respect. Now together with his newfound allies, he must return to face the vengeful townspeople and wage a bloody war with cunning Stanley and his ruthless gang. Co-starring Alan Hale Jr. (TV’s Gilligan’s Island).